Design Your Life : Creating Success Through Personal Style is the name of Rachel Roy's new book. 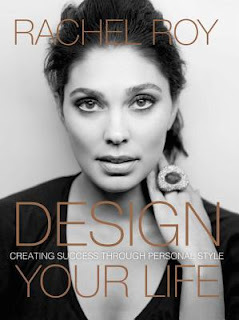 It's a fashion guide and biography (without pics) offering Rachel’s real life experiences and fashion advice to help women develop personal style and manifest a life with intention. You might recognize the name if you've been following the internet rumors from Beyonce's lemonade. This 5'10 Californian of half Dutch-half Indian heritage has styled many celebrity clients including Kim Kardashian and her dresses have been seen on Michelle Obama. Her fashion line can be found at Macy's including a plus size collection. I loved her personal mantras in her book, I got so many great practical tips! It reminded me of Nicky Hilton's book where I wasn't a fan of either before I read the books, but if you're trying to transform your personal style you should definitely pick up their books. Rachel's 200 page book is crammed with helpful tips for women to use as they build a closet full of clothes (or maximize the one they already have) on the way to becoming the best version of themselves. I truly believe in what Rachel says that, "clothing and personal style can affect how you feel about yourself and therefore how you treat yourself, thus fashion plays a major role in self-esteem and the type of energy one gives out.We do better when we look better because we feel better. Confidence makes everyone look and feel savvy, powerful and alluring beyond words. How we dress affects the way we believe in ourselves and hold ourselves and as a result profoundly impacts how others believe in us as well. So especially dress the part at work." What she's saying is that it's not that you need to own a lot of clothes or expensive clothes, but rather you need to know how to dress to flatter your body shape and how to accessorize your outfit. When I look at pictures of myself 10 years ago I thought I was fashionable then, but really my outfits were so plain. And even now while I feel I have mastered the evening look, I don't quite have my casual weekend look down. I only started wearing fashion scarves a couples years ago and still rarely do it. Rachel says, "scarves can instantly up the sophistication factor or completely change the look of any outfit." I feel I need help establishing a distinct personal style to help me look my best because I know I feel better about myself when I have the confidence that I have it all together. I'describe my style as effortlessly chic, simple, beautiful, feminine, and a sophisticated working woman. One of Roy's favorite outfits to wear is a suit which she wore to Kim Kardashian's wedding. You'll have to read her book to find out why she walked a red carpet in her pajamas. lol She says that everyone needs to own a jumpsuit and leather leggings as they look great on everyone and doesn't go out of style. Like me, Rachel is really into vision boards, see mine here. She says, "it gives you goals to work towards every day with a constant visual reminder of your aspirations which are motivating like the law of attraction. Our goals and confidence are expressed not only in what we say but also in our posture and clothing choices and jewelry choices." I also have pinterest boards for fall, summer and work outfits. It helps me shop my closet for ideas with old pieces to see how things can mix and match. Nikki and Rachel both say to never run to the grocery store looking sloppy. Rachel suggests you put together a couple go to weekend outfits for the days you have to run errands and don't want to think about what to wear. By dressing the way you want to be thought of and treated, you're inviting that respect and admiration into your life. It's true, fair or not, you are treated how you look. Rachel says, "when you feel comfortable, you project confidence. When you leave your house I'm a firm believer that it's important to present the sharpest, brightest, best version of yourself - whether you're shopping for groceries, it doesn't matter. Always channel your highest version of yourself. With a little thought, you can put together a few exquisite weekend uniforms that are flattering and comfy on your day off." I never wear flip flops I think they're so unfashionable and Rachel does too. She says, "unless you're getting a pedi leave the flip flops at home. Get some laceless slip-on sneakers. They are modern and youthful and make comfort look as it should:easy." So I went out and bought myself a pair of European rose gold sneakers. When I throw parties in my home I love setting the mood with decor and themed food. I take a lot of time creating my idea for the party, even if it's an intimate get-together. Thus, I dress up and politely suggest to my friends they should too. lol Well I loved reading Rachel saying, "when invited to someone's home or party, I consider dressing respectfully to be just as important as bringing the host a gift. I always consider all the energy of the host put into planning the festivities and I try to match that effort into my attire. I take to heart that the host spent time preparing a space or a meal, or creating an experience for me, and I want to reciprocate the effort and energy in every way I can. One way to try to match that is by putting through into how I present myself. I personally like having the option of being slightly overdressed versus being underdressed, because I'm more likely to project confidence and poise when I err on the side of formal as opposed to casual." Rachel recommends using a clothing steamer over an iron. I have a steamer that I take with me on vacation but never thought to use at home. Rachel says, "When steamed, clothes look the way they're meant to because they hang the way they're meant to drape on your body as opposed to being flattened and pressed against an ironing board. Backstage at runway shows we use steamers as do retail stores." Rachel recommends to save and invest in timeless well-made accessories as it will make you feel your best when balanced with your outfits. You're wearing your personality. I threw out half of my costume necklaces with my recent closet purge. Rachel says, "Accessories are the details that truly convey that a woman cares deeply about how she is perceived and who she wants to be." On the topic of sunglasses, Rachel says, "There's nothing cooler than a pair of sleek aviator shades. They are undeniably fashion consistent and flatter everyone." I bought a pair of purple RayBans on my last trip to New York. "Designer labels and perfectly tailored pieces look exquisite on the outside but their real value is their ability evoke the wearers sense of self-worth and spirit." With that in mind, I invested in my first designer dress, an orange sheath by Diane Von Furstenberg.